Green peas kurma is one of my Amma’s signature dish.This is such a tasty kurma,a must try dish.Few days back when I visited Amma’s place she had prepared this Kurma and I had shot pictures so that I could share it in the space.You may prepare this kurma using only green peas or with a combination of vegetables of your choice.My Amma uses this combination which I have mentioned in the recipe.Of course this is one of my favorite kurma and that is also one of the reason I wanted to share. Green peas is found in abundance during winter which is green in color and pod shaped.It has several nutritional facts.This versatile legume is one of the major crop grown all over temperate and semi tropical region.You may also buy it in abundance , separate the seeds and store it in a freezer in an airtight container or a Ziploc for over a year.Several dishes like green peas pulav and many more dishes can be prepared with this succulent,sweet tasting pea.I add it in most of the dishes like vegetable rulam,Vegetable pulav ,Pancharangi pulav and many more.The best combination with this Kurma is hot puffed puri. Heat 1 tsp ghee and fry coriander leaves,green chillies,cloves and cinnamon for sometime ,off the flame, add turmeric powder and garam masala powder,cool it and grind it into a fine paste along with grated coconut. 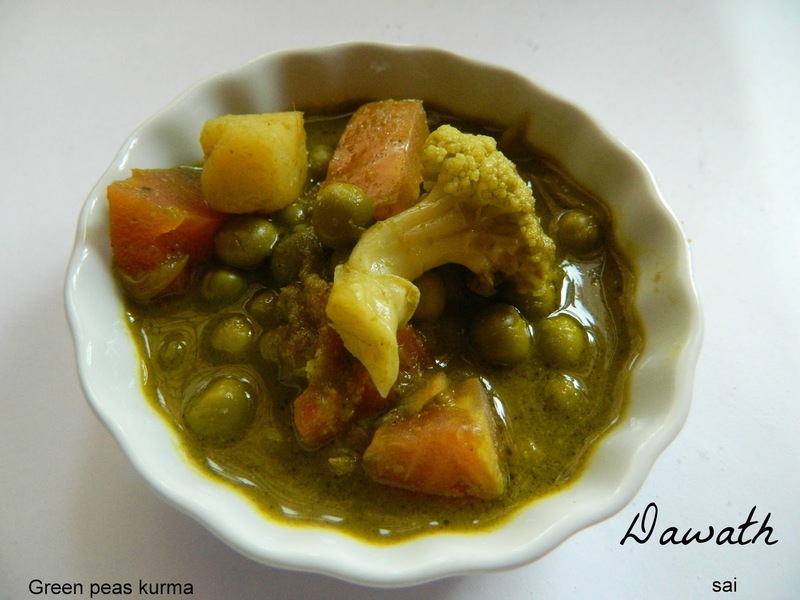 Boil green peas,potato and carrot together in the cooker and keep it aside. Heat 2 tbsp ghee in a pan and fry onion until pinkish in color. Add masala and fry until raw smell disappears. Add tomato and fry for few more minutes. Add boiled green peas,salt to taste and cauliflower florets and cook for 10 -15 minutes. 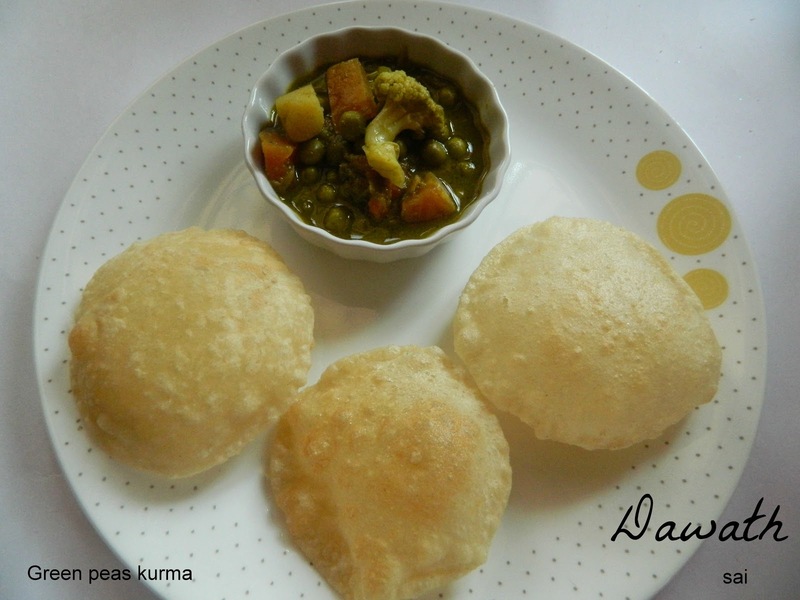 Relish with puri or chapathi. If you want the cauliflower to be cooked until soft you may cook separate and add. We like it just cooked that is little crisp so we add it along with the green peas as it cooks fast. You may or may not add ghee while frying the ingredients for the paste. Wash the coriander leaves thoroughly. Slit the green chillies when you fry ,if you add directly without slitting, it will splutter jump out and is dangerous. Wow, thats Delish! Have to make this right away! !